Lets get creative with some “trash”. You probably have a bin full of cans possibly from last nights green beans. Here are some ideas to upcycle those cans into something beautiful! First you will want to peel the label off the cans and clean them out really well. Be sure to be careful and not cut yourself on the sharp edges! Vases and Centerpieces – Cans can make great little vases to create a beautiful one of a kind centerpiece. To add a little flair to the cans you can do so many things.These different decorating ideas can be used for many of the different ideas for recycling /upcycling cans. If cleaned out really well you can use the cans as little serving containers for things like bread sticks or pretzels. Take ribbon and tie it or glue it around the can. Pedestal – Create a pedestal stand using a can , large plate and a small plate. Paint all three items then turn the small plate upside down and glue the can to the center of the plate. Allow that to dry before moving onto the next step. Once the glue is dry take the large plate and place it upside down and glue the open side of the can to the bottom center of the large plate. Allow this to dry then turn it around so the small plate is the base of your stand and the large plate is the platter. Cans can make great candle holders – Take a small sharpie marker and draw out your design. I have found its easiest to draw the design using dots. Take a drill with a small drill bit and drill a hole where you made each dot. You can then paint the cans. With this you can get extra festive for the holidays. For Halloween create Jack o lantern cans, for Christmas do snowflakes and Christmas trees, even for the 4th of July paint them red, white and blue and drill out a star design. Place a t-light candle in the can and light it to see the finished product. Wall Organizer-Is your office or craft space a little unorganized? Make a wall organizer board using cans. Take a thin metal sheet and glue the cans to it or take a thin sheet of two of and screw the cans to it for a more secure hold. You can decorate the cans and add labels to them for pens, pencils etc. This idea can even work in the kitchen to hold your serving spoons and other items. Organize a Junk Drawer – If you have smaller cans like tuna cans they can be used for organizing your office or junk drawer. They are the perfect fit to hold paper clips, rubber bands and other small items. Wine Rack – Create a fabulous wine rack using coffee cans. For this project you will need to remove the bottom of the can as well as the top so you can see straight through the can. Paint the cans to match the decor of the room you will be putting the wine rack in. When the paint is dry glue the cans together using a strong glue like Krazy Glue. Make sure you glue then together in a balanced way. Flag Windsock – Start with a clean empty can with both ends removed. Use an acrylic paint to paint the outside if the can. Allow the paint to fully dry. Drill four holes near the top of the can on four sides across from one another. Use ribbon for the streamers. A good size is a 1 1/2 inch wide ribbon. Measure each strip of ribbon about 20 inches in length. Eight ribbon strands works well for this project. Glue the ribbons to the inside if the bottom of the can (the end opposite the 4 holes). Take some twine or other kind of rope and thread them through the holes tie a knot to the rope to prevent it from sliding out of the inside of the can. Take the other ends of the four pieces of rope and tie them together to at the top in a secure knot to hang the windsock. 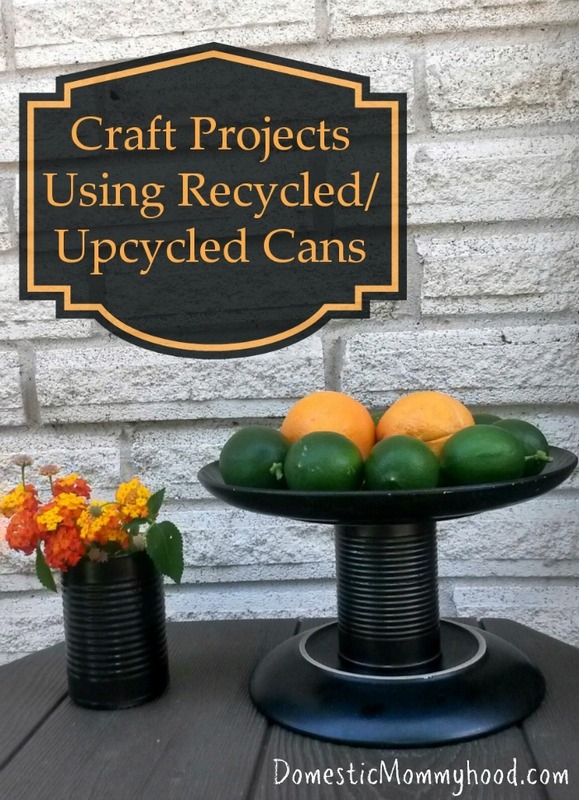 Do you have any great ways to upcycled cans at your home?